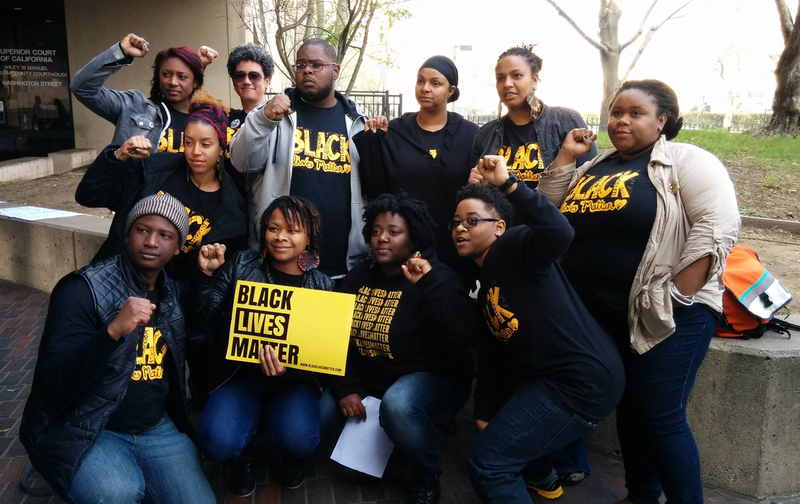 One Year Ago, Black Activists Shut Down the Bay Area’s Subway. Here’s Why They’re Still Fighting. The Black Friday 14 shut down Bay Area Rapid Transit this time last year. They’re demanding that the charges they face be dropped. The day after Thanksgiving last year, 14 black activists shut down Bay Area Rapid Transit—the San Francisco Bay Area’s public transit system—for more than two hours. They did so by chaining themselves to each other and to both east- and westbound trains just after 11 am on the busiest shopping day of the year. They did so because they wanted to draw attention to the wave of police killings of black people that had by then gripped the public consciousness, but not only to that: also to the displacement of longtime and largely black residents from the neighborhood surrounding the train station where they chose to stage their action, and to the specific role that BART’s police force played in abusing black Bay Area residents, from Oscar Grant to Nubia Bowe. The Black Friday 14, as they’ve come to be known, were eventually arrested once police and firefighters could figure out how to disentangle them from one another and the train and take them into custody. Those who carried out the action and their supporters have been fighting ever since to have the penalties they face dropped. Those penalties—misdemeanor charges and $70,000 in restitution to BART—were unjust, they argue, when compared with what happened to those who similarly used their bodies to disrupt business as usual. If you recall, late 2014 was a time when the rallying cry “Shut it down!” was everywhere, from the Brooklyn Bridge to Boston highways to the Mall of America to the BART train. Students and community members who shut down a section of the I-80 in Berkeley interstate faced no charges. White and Asian-American activists who blockaded the police headquarters in downtown Oakland were largely cited and released. The call for Alameda County District Attorney Nancy O’Malley to drop the charges against the Black Friday 14 has reached a fever pitch in the days leading up to the anniversary of the action. Earlier this month, on the Fight for $15 national day of action, local labor leaders gathered at O’Malley’s office to make the demand. The “fight for the economic equality can’t be separated from racism,” one such labor leader is reported to have said. “[It’s] time for labor to understand that our fight isn’t just against economic inequality but also against racism.” That labor has become a vocal advocate for the Black Friday 14 is important, as BART board members have repeatedly tried to portray those victimized by the action as workers, people who depend on BART for transportation to their jobs, rather than as shoppers out to find Black Friday deals. It may seem from recent weeks that organizing in support of the movement for black lives has largely moved from the streets to campuses such as the University of Missouri, Yale, and Princeton. But that’s an oversimplification. From recent news out of Minneapolis—where five people protesting the police killing of Jamar Clark were shot by agitators Monday night—to protests in Chicago, to the Black Friday 14’s unfinished business in Oakland, the fight is still everywhere.